Windows 10 Hints and Tips for Performing Musicians. As more and more musicians are using digital music display for performing, it is vitally important that nothing untoward happens on-screen during performance. The last thing you want to happen is for a message to pop up on screen saying “Restarting. Installing updates in 10, 9, 8… seconds”. AARRGGHHH!!! In this article I will be looking at ways to avoid this type of scenario when running Windows 10 and also some general hints and tips. 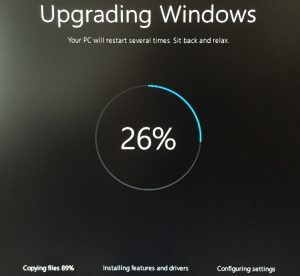 Microsoft have been very “helpful” in the latest versions of their operating systems by “forcing” the installation of updates, so trying to avoid the situation where users fail to install critical updates or virus definitions and as a result have major issues with their PC. Microsoft also use ways of extending battery life, in particularly on tablet PCs by blanking the screen or putting the PC to sleep after a period of inactivity, both of which are definitely not desirable when performing. This article is an FAQ about running Power Music on Windows 10 Home edition. Over the years that I have been working with Windows 10 a number of users have raised questions about the best way to set up Windows 10 for using a PC for performing. So here are some of the tips I have discovered. Some are general hints and tips and some are more relevant to performing. If you have other hints and tips please add them in a Comment. Most of these fixes are accessed in the Settings panel of Windows 10. To get to this, click on the Windows Start menu then click on the “gear wheel”. It is also available from the Action Centre on the bottom right of your screen. This is what Start/Settings means in this article. What Windows version am I running? How can I make icons and menus bigger on my touchscreen? How do I stop the screen going blank? How do I stop the PC going to sleep? What is “fast start up”? What is the difference between Restart and Shutdown? Why is Auto-rotation not working on my tablet? Why does my default printer change? Can I remove the big Cortana search box? Can I get a standard keyboard on screen? How do I stop the touch keyboard covering where I want to type? Can I show all the icons on the system tray? How do I stop notifications popping up? How do I know what updates have been successfully installed? How do I change when Windows will do a restart after updates? Can I recover disk space after a major Windows upgrade? It is important to know exactly what version of Windows you are currently running. On small and high resolution screens the icons and menus can be quite small. To increase the overall size of these change the scaling factor. Move the slider to 125% or 150%. I would not recommend using a scaling factor larger than 150%. You may have to log out to make the change take effect. Set drop down to “Never” for both battery and mains. To decrease the time taken for Windows to start up, Windows can save some of the information in RAM to the hard drive so that when the PC is switched back on this information can quickly be loaded into RAM making start up quicker. It’s a bit like a type of Hibernation. This sounds like a good idea but I have come across some issues with this. Firstly the shutdown process takes a little longer and there is a danger in mains powered systems for the user to remove the power from the PC before it has finished doing the shutdown. The screen goes blank but the hard drive continues to be accessed. This has led to corrupted files on the PC. Secondly on battery powered systems I have come across a strange problem where the PC would not shutdown – it continually restarted itself! This was fixed by switching off the “fast start up” option. When you are installing updates or trying to resolve an issue with the PC not running correctly it is important that you perform a number of Restarts not Shutdowns. A Restart will completely reload all the operating system and drivers whereas Shutdown does not. If a tablet PC has a rotation detection sensor then the screen display should automatically display portrait or landscape. If this is not happening then the Rotation lock must be switch on. Alternatively, Swipe in from the right of the screen to see the Action Centre then tap the Rotation lock tile. Windows 10 has a large search box beside the Start menu. This can be a nuisance if you have a large number of program icons on the taskbar. The standard on-screen touch keyboard is a simplified keyboard with some keys “missing” for example: Escape, Alt, Fn, the Windows key and a full set of arrow keys. Bring up the on-screen keyboard and tap on the bottom right icon (a keyboard), select the furthest right keyboard icon. To change back select the furthest left keyboard icon. The on-screen keyboard can be docked (fixed at the bottom of the screen) or allowed to float (moved about the screen). Bring up the on-screen keyboard, tap the icon to the left of the X (close keyboard). This toggles between docked and floating. To move a floating keyboard, drag the top bar of the keyboard. Switch on to see all icons. If you are having issues with your PC the first thing to check is the status of Updates. If updates are available then tap on “Install now”. To check that all updates have been successfully installed tap on “Update history”. If not Restart (not Shutdown) the PC a couple of times. After installing a major Windows 10 upgrade (for example the 1607 Anniversary update) up to 12GB of space on the hard drive could be used up keeping the old Windows installation and downloaded files. This is a significant amount of space on a 32GB drive, which is used in most small Windows tablet PCs. If you are not going to revert back to your previous operating system these files can safely be removed to free up space on the hard drive. Click on “Disk Clean-up” and wait for it to check for files. Click on “Clean-up System Files” and wait for it to check for files. Tick the boxes for old Windows installation files. Click OK and wait for it to recover up to 12GB of space! I hope this article has been helpful. If you have other hints and tips please add them in a Comment below.